Robert Eklund ’17 watches his golf ball fly during a match against University. Eklund, one of two captains on the team, has helped the Knights to their undefeated season. With a tournament win and undefeated season to date, the golf team looks poised to capture its first-ever league title and contend for a North Coast Section title as well. 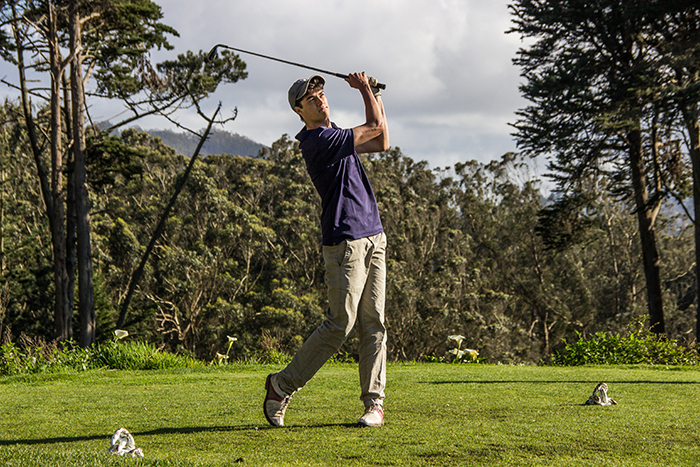 With golf practice at the Presidio Golf Course four days a week and conditioning in the Presidio on Fridays, the team looks to see results in matches. To date, Stuart Hall has defeated University twice, Marin Academy twice, and the Bay school and Urban once. The team beat the Bay School with a 2-over par from the team’s top golfer, Gianluca Mori ’18, and a 6-over par from Chris Potter ’17. The Knights followed that win by beating University with a score of 178-182, with No. 5 and 6-ranked golfers, Michael Tellini ’17 and Owen Fahy ’18, posting scores of +8 and +12, respectively. When the Knights and Devils met for a second time, the Knights prevailed by a much more convincing margin of 164- 188. Senior Hunter Tatham shot +4 to lead the Hall to victory. The Knights’ biggest challenge was in the form of Marin Academy who they have beaten twice this season with scores of 159-170 and 155-163. The team was scheduled to play a dozen or so matches this year before record-breaking rainfall drenched courses across the Bay Area. Four matches have already been cancelled, with rain to blame for three of them. The top six of 10 golfers compete in BCL league matches, while in the tournaments a more select group of the top performing student athletes play because an entire day of school is missed in order to compete. The team has already played in two of its three tournaments, where The Hall emerged triumphant on March 9 at the Bay Links Challenge. Gianluca Mori shot an impressive 74, only 2-over par, during that tournament, leading the Knights to the win. The next tournament for the Knights is on May 2 at Harding Park when six of the Knights golfers will compete in the league tournament, and a chance at an automatic berth in NCS. “I think we have a great shot at winning league this year,” Potter said. “Especially after a great win against Marin Academy. It feels great to beat them, first time we’ve won against them during my four years at the Hall.